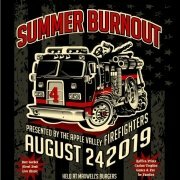 This car show will take place August 24th, 2019 at Maxwell’s Burgers in Apple Valley. It will benefit local Veterans at the Orenda Foundation. Mark your calendars, tell your friends and bring out those beautiful cars to show off. Please share this post with all your friends and social media outlets. 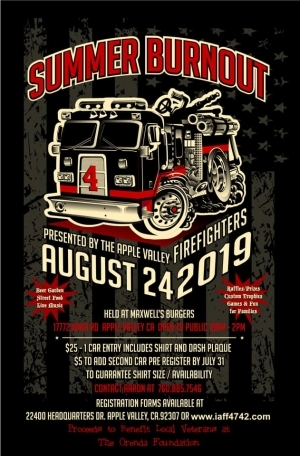 Registration forms can be found on our website www.iaff4742.com. 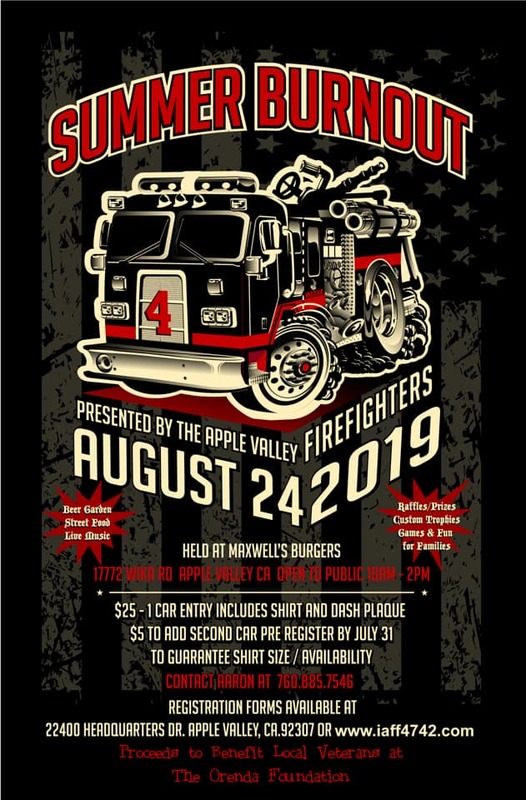 The Apple Valley Professional Firefighters Association is proud to inform our community of what is going on with your Fire District. Upon the successful passing of Measure A, thanks to the support of the community, our District has grown and evolved. This growth has allowed us to have more of a presence in our community and provide the Town and its citizens the care and support they are so deserving of. Again, we your firefighters want to thank you for your support. You supported us and we’re here to support you. This November two (2) seats on the Apple Valley Fire District Governing Board are set to expire. Your firefighters were very proactive to find qualified candidates that will not only represent you, the local citizen, but also to find candidates that can move our District forward into the future. 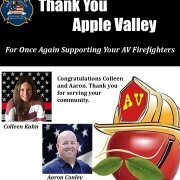 This is why your firefighters endorse Colleen Kuhn and Ronald (Aaron) Conley for the Apple Valley Fire District Governing Board. 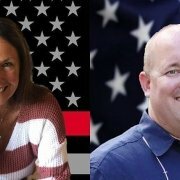 These candidates have a history in public service and have the knowledge to understand how your Fire District operates, but also the ability to ensure your Fire District continues to serve the community to its fullest potential. In the coming weeks and days we’ll be posting more information on these two experienced candidates. Please click on the links below to learn more about these candidates and check back often. CAL FIRE Heavy Fire Equipment Operator tragically killed. 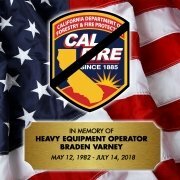 It is with deep sadness that CAL FIRE can confirm that this morning while battling the Ferguson Fire on the Sierra National Forest, CAL FIRE Heavy Fire Equipment Operator Braden Varney from the CAL FIRE Madera-Mariposa-Merced Unit was tragically killed. He leaves behind a wife and two small children. Please join us in keeping Braden, his loved ones and his fellow fire family in your thoughts as they grieve this sudden loss. https://www.iaff4742.org/wp-content/uploads/2018/07/37101511_10156569890002390_2566155367796965376_o.jpg 2048 2048 Marc DiLeo https://www.iaff4742.org/wp-content/uploads/2019/01/PFALogo.png Marc DiLeo2018-07-15 22:10:132018-11-03 12:46:04CAL FIRE Heavy Fire Equipment Operator tragically killed.